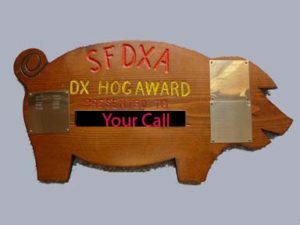 HEREAFTER AND ALWAYS shall recipient be entitled to be called a DX HOG ! The recipient MUST display this award in a prominent place in the recipient’s Ham Shack. If this award is not found in the shack by fellow member DX Hogs, recipient shall be liable to buy said member the beverage of their choice. This award is presented during the Annual DX dinner, or other suitable forum, and has been a traveling award since 1980. The FINE PRINT: The newly installed DX HOG can negate the consequences of the last requirement, i.e. having to buy the other DX hogs drinks for non-display of the HOG in the Shack in only one way: recipient must wear the honorable DX HOG HAT for the duration of the Hamfest while in and or around the Hamfest premises.